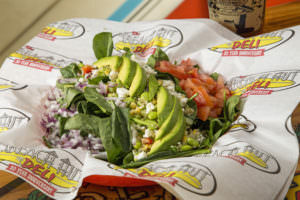 All salads made on your choice of farm fresh iceberg, spinach, or romaine. A mixture of quinoa, edamame, corn, and bell pepper, topped with tomatoes, onions, sliced avocado, and feta cheese. Served with a side of lemon garlic Italian dressing. Chopped ham, turkey, salami, cheddar and monterey jack, tomatoes, onions, and Greek peppers. Topped with crumbled bacon and sliced avocado. Your choice of hot or cold grilled chicken, Frank’s® Hot Buffalo Wing sauce, monterey jack, tomatoes, onions, and peppers. Topped with blue cheese crumbles, crumbled bacon, and sliced avocado. Your choice of hot or cold grilled chicken, pepper jack, Bulls-Eye® BBQ sauce, tomatoes, onions, and Greek peppers. Topped with crumbled bacon. Albacore tuna, tomatoes, onions, and Greek peppers, topped with chopped monterey jack and sliced avocado. Pulled pork, melted pepper jack, Bulls-eye® BBQ Sauce, onions, and fresh pineapple. Topped with crumbled bacon. 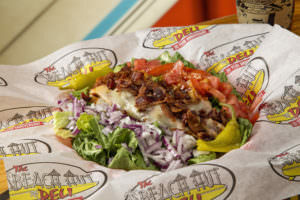 Iceberg wedge topped with buttermilk ranch dressing, tomatoes, onions, crumbled bacon, and blue cheese crumbles. Served with a side of blue cheese dressing. 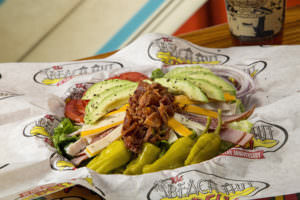 Dressing Options: Ranch, Creamy BBQ Ranch, Spicy Ranch, Blue Cheese, Thousand Island, Italian or Balsamic.